Understanding and modelling the individual anatomy of the brain and its variability over a population is made difficult by the absence of physical models for comparing different subjects, the complexity of shapes, and the high number of degrees of freedom implied. This also raises the need for statistics on objects like curves, surfaces and deformations that do not belong to standard Euclidean spaces. Applications are very important both in neuroscience, to minimize the influence of the anatomical variability in functional group analyses, and in medical imaging, to better drive the adaptation of generic models of the anatomy (atlas) into patient-specific data. The @neurIST project will develop a vertical and integrative approach to knowledge discovery, personalized risk assessment, patient guideline generation and treatment design. The project will have a big impact on the way that cerebral aneurysms are understood and handled and will provide a reusable and scalable approach to other diseases. Approaching biology as the physical science of living matter dictates the development of a parsimonious mathematical and computational formulation of multiscale biological phenomena. Such a long-term endeavour must be collaborative on a worldwide scale. The combination of cancer biology with in silico oncology can serve as a valuable paradigm for such a process. Here we outline simulation results on the response of tumorous and normal tissues to therapeutic schemes. These simulations were developed over the last decade by the In Silico Oncology Group at the National Technical University of Athens. Can virtual reality help to understand tumour growth? Researchers at the Section Computational Science of the University of Amsterdam (UvA), SARA Computing and Networking Services (SARA) in the Netherlands and the In-Silico Oncology Group of the National Technical University of Athens (NTUA) have combined interactive Virtual Reality visualization with in-silico tumour simulation models to better comprehend tumour growth and optimize the planning of treatment schemes. In the framework of two projects we present problems and advances in developing functional musculoskeletal models. 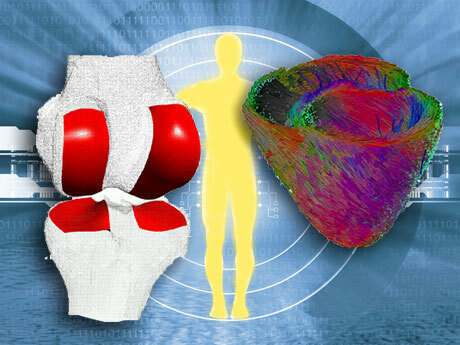 Researchers at the MEM Research Center (Institute for Surgical Technology and Biomechanics, University of Bern), in collaboration with Stryker Osteosynthesis, are constructing advanced statistical digital models of bone shape and biomechanical properties. These models will lead to the design of a new breed of orthopaedic implants that will guarantee an optimal fit for the whole range of patients. Hyperthermia is a promising treatment modality for various types of cancer. The difficulty of administering high-quality patient-specific treatment has so far hindered the acceptance of hyperthermia in most countries. Can a new approach for treatment-planning tools help? There has long been a consensus that there is a pressing need to bridge the gap between basic and clinical sciences, to ensure that basic research discoveries of potential relevance to patient care are effectively applied. This is a formidable challenge to implement. One of the key problems is the lack of a framework or model that would link clinically relevant information to the knowledge obtained across multiple disciplines, experimental platforms and biological systems. Fibered confocal microscopy allows the acquisition of in vivo and in situ images at the cellular level, in combination with standard endoscopic procedures or needle biopsies for solid organs. This makes it a promising tool for clinical molecular imaging, an activity aiming at in vivo characterization and measurement of biological processes. Confocal microscopy images represent a new source of information for developing patient-specific digital models that integrate knowledge of cellular dynamics. This is also an unrivaled technique for refining digital patient models down to the microscopic level. The Personal Space Station (PSS) brings Virtual Reality (VR) to the desktop of the medical and scientific professional. Its purpose is to make VR more useful and accessible for the effective analysis of 3D and 4D data in medical and biological research. To this end, PS-Tech in the Netherlands and CWI are developing and improving new techniques and methods for the application of VR in 3D and 4D data analysis. The human auditory system processes very complex audio signals and deduces meaningful information like speech and music. Conventional speech processors for cochlea implants use mathematically based information-coding strategies. In a new approach being investigated by researchers at the Fraunhofer Institute for Digital Media Technology (IDMT), the human auditory system is digitally modelled as naturally as possible. This leads to a better understanding of the neural representation of sounds and their subsequent processing. The Integrative Biology (IB) project, funded by EPSRC, is nearing completion with the building of a customized Grid framework. This is being used to run large multi-scale models, from cellular to whole organ simulations, to manage a growing database of in-vitro experimental data and simulation results, and to support advanced visualization for interactive data analysis with comparison and assimilation of experimental and observed data. The services offered by the computational framework are based on the requirements of two application areas: arrhythmia and cancer. Computational and experimental biologists are using the prototype infrastructure, thereby aiding the STFC computer scientists in improving the framework and its services. Systems biology, an integrated research field involving experimental biology and computational modelling, takes a systems-level view of biological phenomena without losing the detail and complexity that is inherent in all biological systems. I call this the 'in virtuo' approach (in preference to 'in silico' which seems to imply a specific computational technology). Two investigations are discussed: one looking at how part of the innate immune system works, and the other at how skin seems to heal wounds. Substantial advances in predictive, preventive and personalized (PPP) medicine are starting to emerge from computational simulations of complex networked models of metabolism ranging to the molecular level of detail. From the systems biology perspective of the digital patient, diseases are perturbations of biological networks through defective genes or environmental stimuli, and therapies are the interventions needed to restore these networks to their normal states. The Bioinformatics group at FORTH Heraklion is developing novel computational methods for identifying new parts of these networks both from genomic sequences and from metabolite time-series, and to generate meaningful visualizations of them. The 'Digital Human Modeling and Perception-Based Safety Design' project is intended to minimize or reduce the need for physical prototyping in design. Researchers at Purdue University from across different colleges have the opportunity to work collaboratively on projects in this area through the Regenstrief Center for Healthcare Engineering and Discovery Park. The work has origins in automotive, aerospace and military vehicle design.